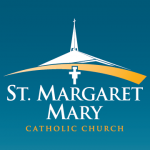 We, the Catholic Community of Saint Margaret Mary Church, are called by God to be brothers and sisters of Jesus through His life, death and resurrection. We are challenged, through the power of the Holy Spirit, to recognize, become like, and share Christ Jesus in Sacrament, service to others and the sharing of our gifts and the Good News. In this, God’s Reign is established. By loving God above all else, and by loving others as ourselves. By participating fully in the sacramental life of the Church. By seeking God’s grace through prayer and spiritual renewal. By serving others through corporal and spiritual works of mercy. By supporting the education and religious formation of children, young people and adults in the Roman Catholic tradition. By sharing, with joy and generosity, our unique talents, our time, our treasure, our personal witness of faith, and our practice of charity. By evangelizing our community and the world through our example of Christian living and our witness to our faith in Christ and the Church. By being a welcoming community, respecting the diversity of gifts and cultures.